Cesar is used to stressful situations. The four-year-old German shepherd served three tours of duty as a military service dog before being discharged to a facility that trains canine veterans to work in law enforcement. Now, Cesar will join the NYPD as the department's first-ever veteran military dog. In addition to military training, Cesar also went through training at the Transit Crime Unit in North Carolina, run by Randy Brenner. 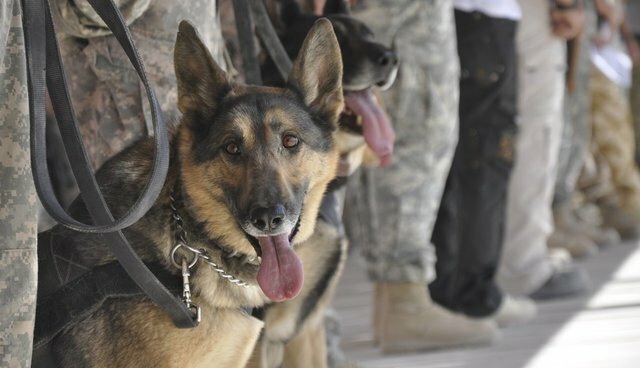 "[Military dogs] love to work," Brenner told the New York Daily News. "Every day is a good day as long as they work... [And] they are already used to stressful situations." Medical experts say Cesar does not show signs of post-traumatic stress disorder, from which many veterans suffer, and that his past experience coping with high-stress situations will make him well-adapted to police work. NYPD would have spent thousands of dollars training a dog less experienced than Cesar, according to a department spokesperson. "We are saving the city money," the spokesperson said, "as well as saving a dog."